Engineering Plasticity deals with certain features of the theory of plasticity that can be applied to engineering design. Topics covered range from specification of an ideal plastic material to the behavior of structures made of idealized elastic-plastic material, theorems of plastic theory, and rotating discs, along with torsion, indentation problems, and slip-line fields. 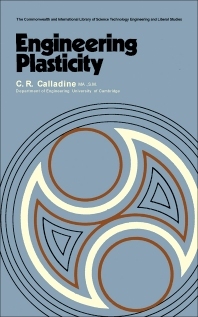 This book consists of 12 chapters and begins by providing an engineering background for the theory of plasticity, with emphasis on the use of metals in structural engineering; the nature of physical theories; and the conceptual simplicity and power of plastic theory. The next chapter explains how to set up a model of the plastic behavior of metal for use in analysis and design of structures and forming processes, paying particular attention to the plastic deformation that occurs when a specimen of metal is stressed. Subsequent chapters focus on the behavior of a simple structure made of elastic-plastic material; theorems of plastic theory; rotating discs; and indentation problems. Torsion, slip-line fields, and circular plates under transverse loading are also discussed, together with wire-drawing and extrusion and the effects of changes in geometry on structure. This monograph is written primarily for engineering students.